Wenn ich im Internet unterwegs bin, vor allem in den paläontologisch-geologischen Gruppen von Facebook, werde ich oft gefragt: Was ist die Montana Fauna? Wie fügt sie sich ein in das präkambrische System? Deshalb nun hier ein Auszug aus meinem Buch "Wohin die Spuren führen" (Bd. 1), in dem ich die Montana-Fauna etabliert habe. Der englische Text danach stammt aus dem 2. Band, der ins Englische übertragen wurde. When I am on the way in the internet, especially in the paleaontogogical and geological groups, I often was asked: What's the Montana Biota? How is it integrated in the Precambrian system? Therefore I publish here an extraction of my book "Wohin die Spuren führen", volume 1 (German) and of my book "The New Precambrian" (English). Der Paläontologe Sören Jensen schreibt 2003 in einer Publikation der "Oxford Journals": "Tatsächlich datieren alle unzweifelhaften Spurenfossilien nach dem oberpräkambrischen Eiszeitalter, das vor rund 590-570 Jahren endete." 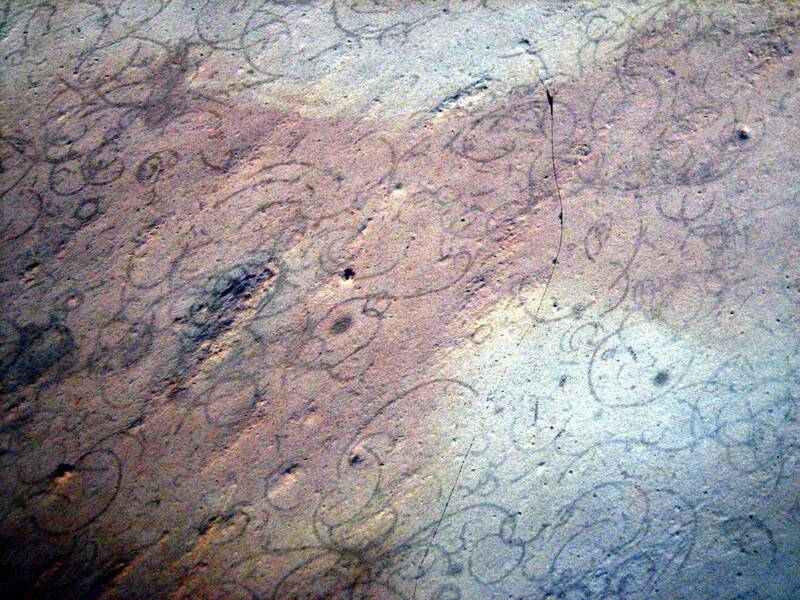 Und Adolf Seilacher stellt nun in "Fossil Art" 2008 fest: "Nachdem das Leben auf unserem Planeten vor etwa 3,5 Milliarden Jahren mit mikroskopischen Einzellern begonnen hatte, entstanden nach der letzten großen Eiszeit ‚Schneeball Erde' vor etwa 600 Millionen Jahren die ersten Großorganismen..."
In Namibia fanden Forscher 2012 rund 760 Millionen Jahre alte mehrzellige Fossilien, die als Schwämme gedeutet werden. Das verlegt den Beginn des mehrzelligen Lebens schon mal rund 150 Millionen Jahre zurück. Aber dieser Zeitraum deckt sich noch einigermaßen mit den alten Ergebnissen der Genforschung, der heutzutage eine großartige, wenn auch offenbar nicht ganz sichere Methode zur Verfügung steht: Genveränderungen mathematisch zurück zu verfolgen. Beim ersten Versuch dieser Art kam man 1982 zu dem Ergebnis, dass der erste tierische Vorfahr vor maximal 900 Millionen Jahren lebte, wahrscheinlich aber doch etwas später. Die Paläontologen lehnten sich lächelnd zurück. Das passte einigermaßen ins bestehende Schema. Die Untersuchungs- und Mess-Methoden haben sich danach jedoch erheblich verfeinert. Im Oktober 1996 konnte die amerikanische Nachrichtenagentur AP melden: "Älteste Fossilien bereits Nachzügler". Neue Messungen von Molekularbiologen hatten ergeben, dass der Urahn aller Tiere bereits vor 1200 Millionen Jahren lebte. Ob mein Endeholzer "Wellenwurm" oder Seilachers "Haarnadel" nun Fossilien oder Pseudofossilien sind - dass es vor dem Kambrium und vor der Vereisung im jüngeren Präkambrium bereits mehrzelliges Leben gab, kann spätestens seit Horodyskia nicht mehr bezweifelt werden. Deshalb gehe ich von einer existierenden Fauna vom mittleren Paläoproterozoikum bis ins Neoproterozoikum aus (um diese Fauna in diesem Zeitraum kurz und prägnant zu kennzeichnen, nenne ich sie ab jetzt "Montana-Fauna" nach dem ersten Fundort von Horodyskia). Mit Sicherheit wird sich die “Montana-Fauna” vervollständigen, wenn man nicht mehr davon ausgeht, dass nicht sein kann, was nicht sein darf, sondern entsprechende Funde gleich ernsthaft untersucht und einordnet, anstatt sie als Pseudo- oder Dubiofossilien in irgendeine Schublade zu werfen und zu vergessen bzw. gar nicht erst zu bergen. Die Frage: "Warum macht das Leben auf der Erde seit 600 Millionen Jahren eine stürmische Entwicklung - und rund 4 Milliarden Jahre lang tat sich außer den von Cyanobakterien (auch Blaualgen genannt) aufgebauten sogenannten Stromatolithen gar nichts?" ist jetzt leichter zu beantworten, denn es tat sich sehr wohl etwas! Neueste Forschungsarbeiten gehen sogar davon aus, dass es bereits vor 2,3 Milliarden Jahren (unteres Paläoproterozoikum) Mehrzelligkeit gegeben hat - bei besagten Cyanobakterien (Bettina Schirrmeister, Universität Zürich, 2011). Schirrmeisters Doktorvater Homayoun Bagheri: "Warum es den Cyanobakterien dennoch nicht gelang, sich wie die Eukaryoten (Einzeller mit Zellkern) zu höheren Lebensformen zu entwickeln, obwohl sie sogar in der Lage sind, differenzierte Zellen zu bilden, ist für uns nach wie vor ein ungelöstes Rätsel." Aber was weiß man schon über die Vorgänge in diesen gewaltigen Zeiträumen? Was wird neu entdeckt? Was wird anders zugeordnet oder interpretiert? Was ist noch verborgen im Gestein? Was ist durch Erosion vielleicht für immer verloren gegangen? Der Biochemiker Rupert Sheldrake beschreibt 1981 das Dilemma zutreffend: "Der Ursprung des Lebens - dieses Problem ist nicht minder unlösbar als das der Evolution ... Zum einen wird man nie mit Sicherheit wissen, was sich in der fernen Vergangenheit abspielte. Wir werden immer eine Überfülle an Spekulation haben, unter welchen Umständen der Ursprung des Lebens auf der Erde stattgefunden hat." When I am on the way in the internet, especially in the paleaontogogical and geological groups, I often was asked: What's the Montana Biota? How is it integrated in the Precambrian system? Therefore I publish here an extraction of my book "Wohin die Spuren führen", volume 1 (German, above) and of my book "The New Precambrian" (English). At any rate, the end of the Franceville biota is characterized by a sudden drop in oxygen levels reaching values comparable to the time before the GOE as well as the impact of a very large asteroid. Considering the acquired data, the Franceville biota probably developed at the end of the ice age 2.2 billion years ago and came to an end with the devastating major impact and the drastic drop in oxygen levels roughly 2.025 billion years ago. This would sum up to an existence of 175 million years at most. In the following period, the oxygen concentrations proved to have risen again slightly (Frei/Canfield, "Nature" 2009). We are talking here about a gradually developing oxygen levels of up to 4 per cent; today the oxygen levels amount to roughly 21 per cent. In any case, the avid unicellular stromatolite producers went on about their business using photosynthesis... Up to approximately 1 billion years ago, they were very abundant in almost all shore waters, but then started to suffer considerable losses in terms of biodiversity and prevalence. They are presumed to have been grazed by the score and forced out by multicellular eukaryotes. In general, the period between 1.8 and 0.8 billion years ago has been referred to as "boring billion". Again and again, scientists have been searching for an explanation for this phenomenon, because they cannot imagine why life did not make any progress for such a long time. Also in 2014, at the University of Tasmania in Australia, where geology professor Ross Large conducted seabed analyses and blamed the lack of vital trace metals at that time for the "boring wasteland". Quite unnecessarily! Why searching for the reasons of a "boring billion", if proof of multicellular life at that time has long since been around? Quite to the contrary, the "boring billion" offers rather exiting prospects. Not least the discovery of the Gabonionta showed that anything is possible. Though you must be exceptionally lucky and highly idealistic to stumble upon undisturbed strata from that period, which even give account of life in that era. How did Professor El Albani put it? Yes indeed, there had been a transitory biota. 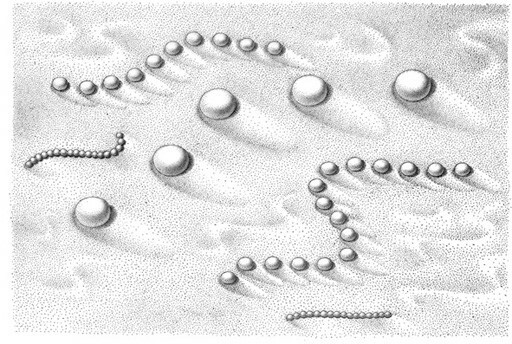 Even he himself was at first convinced that after his Franceville biota and before the Ediacara biota there was a major setback to unicellularity and that multicellular life took a second run-up, so to speak. Simply "boring billion". 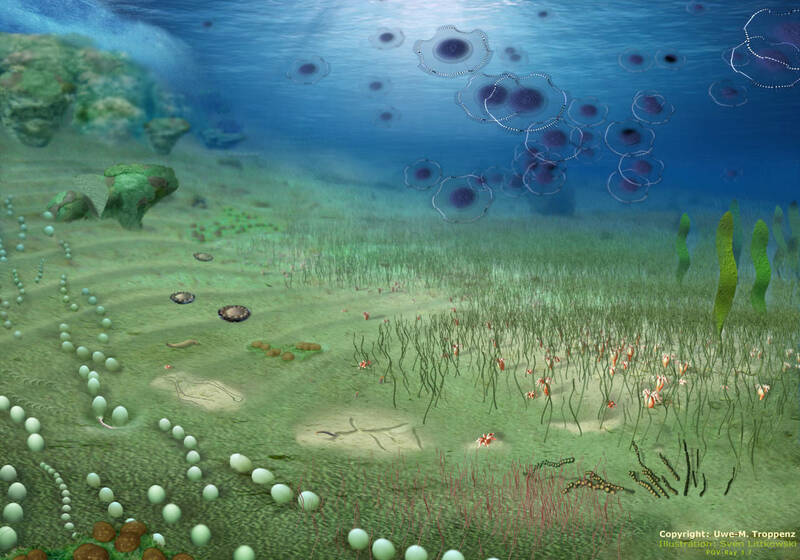 The Gabonionta, however, did by no means reschedule multicellular biosphere to 1.5 billion years earlier, as press releases of the University of Poitiers and the Museum of Natural History in Vienna outlined. They were merely the (what we know today) beginning of multicellular life, which developed after a catastrophic event for the old world and seemed to vanish with another catastrophe in order to take on new forms - during the period of the "bustling billion". 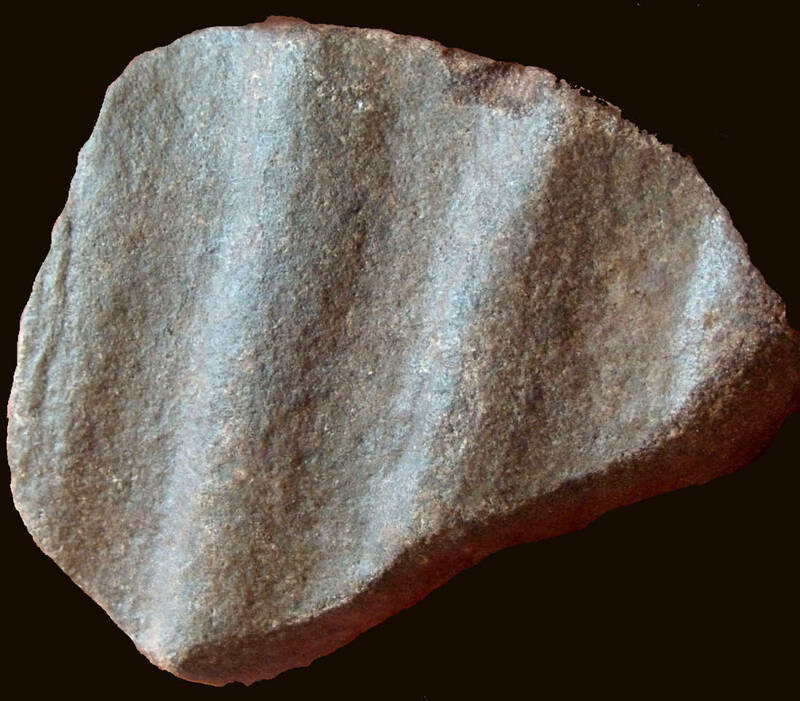 The Franceville biota lasted about 175 million years, the Ediacara biota as little as 70 million years or even less. In between, there were 1000 million years, which should not have produced anything despite a renewed increase in oxygen levels? There are some multicellular organisms, which I presented in my previous book, and which belong to this period of time: the "Wellenwurm" (worm trace?) from the glacial erratic boulders of Endeholz in Lower Saxony/Germany (Swedish Dala sandstone) and another problematic specimen (traces?) 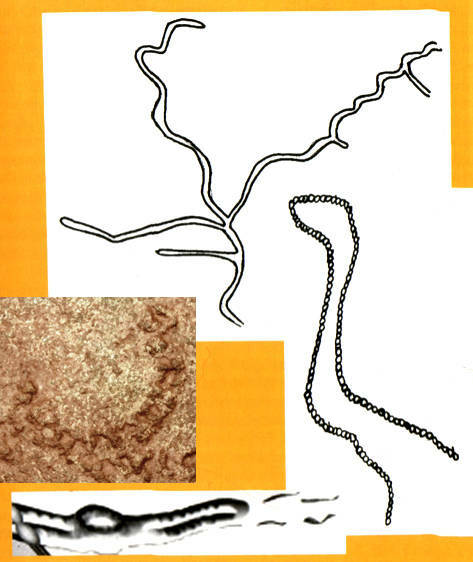 found in the same region and originating in the period of about 1.3 billion years ago; the problematic specimens also from the Upper Precambrian of Dalarna/Sweden; Adolf Seilacher's "Pre-Ediacaran dubiostructures" - the worm trace Manchuriophycus (later interpreted as torn biomat, 1.8 Ga); the Australian "hairpins" Myxomitodes stirlingensis (1.8 Ga); the Indian "Chorhat worm burrows" (1.1-1.5 Ga) and the "string of beads" Horodyskia sp., identified as macroorganism in 2013 and first found in Montana/Canada (therefore "Montana biota") and then in Western Australia (1.2-1.5 Ga). Additionally, there are several individual fossils with an age reaching into the "bustling billion", such as the aforementioned alga Grypania spiralis, found for example in Michigan/USA (2.1 Ga) and in Gaoyuzhuang/China (1.3 Ga), or the Ediacaran fossil Cyclomedusa, discovered also in one-billion-year-old sediment in Siberia - and, by the way, even lasting up to the Cambrian. Or the red alga Bangiomorpha pubescens from the Canadian Arctic (1.2 Ga)... The reason, why the yield is still very small, is that "it contradicts the doctrine". Finds beyond Ediacara have just not been taken seriously. Professor Seilacher's crucial argument against Manchuriophycus (2008): "Alone considering its age (1.8 billion years) is its interpretation as worm trace impossible." In the face of the Franceville biota, this argument has finally lost its value. Nobody really dared accepting an animate world before Ediacara, analysing the fossils correspondingly and publishing the results. It cannot be held against any scientist that they prefer the supporting wave of "political correctness" and respect generally recognized principles, lest they run the risk of ruining their reputation... At the same time, a thousand million years is such an enormous period of time - after all nearly twice as long as the Phanerozoic - in which surely there must be ample palaeontological rewards hiding.